So I’m shopping for an engagement ring for my future ex-wife. I already have a pretty good idea in terms of what I want. Not that I’m so intuitive about women or anything like that. No, she had told me a year earlier exactly what she wanted if she were ever to get married, hint, hint. And like a good boyfriend, I had written it down. I’m lucky. I’m sitting in a friend’s office. He works in the family business, one of the largest diamond wholesalers in Asia. He normally deals with ridiculously wealthy customers so I’m fortunate that he’s doing me this favour. I know I’m not going to get ripped off. I quickly learn that there is a whole different language when it comes to buying an engagement ring. You’ve got four Cs to be aware of: clarity, color, cut and carat. ‘Clarity’ refers to the purity of the diamond. Apparently, there are defects inside a diamond. I say ‘apparently’ because most of these flaws can only be seen with the help of a microscope or a magnifying glass. Not even your girlfriend’s bionic vision, which can spot a poorly washed plate from the other side of the kitchen, could detect most defects. ‘Color’ measures the extent of discoloring in a white diamond. There are twenty-three different grades of white, with ‘D’ (colorless) being the most valuable and ‘Z’ (light yellow) the least desirable. I’ve always been a bit slow when it comes to languages. I only mastered my ABCs in grade three. Perhaps that’s why my eyes could detect no difference between D, E, F and G.
‘Cut’ measures craftsmanship, taking into account symmetry, cut and polish. The better the cut, the better the refraction of light and the more brilliant the end result. There is no grading system for this very important C so most shoppers pay little heed to it. Instead, they obsess about clarity and color where without a grading system, they would not be able to tell the difference. ‘Carat’ refers to the size of the diamond. Bigger is always better. Unfortunately, bigger is also more expensive. Too bad our women don’t like their diamonds the way they like their dress size. I’m sitting there getting very confused by all this new terminology. I want to get my girl what she asked for, because anything less means I don’t love her, right? Unfortunately, he does not have her exact specifications in stock. I have to make some decisions on my own. I’m not a stupid man. I err towards the more expensive. Only the best for my girl. It never even occurs to me to get her anything other than a real diamond, although there are alternatives. There are simulated diamonds, like Cubic Zirconia, which simply look like natural diamonds. And there are manufactured diamonds that have an identical chemical composition. Both of these substitutes are significantly cheaper than natural diamonds. That is, until you factor in the emotional cost of trying to convince your fiancé that you’re not a penny-pinching jackass. It’s understandable why most women would not want a simulated diamond. It is quite easy to tell it apart from natural diamond. Cubic Zirconia, for instance, is very heavy. A one-carat real diamond weighs roughly the same as two toothpicks. A Cubic Zirconia stone of similar size would weigh the backbreaking equivalent of three and a half toothpicks. Cubic Zirconia is also not as durable as real diamond. Sure, it can scratch glass and steel and is harder than just about any other natural gem. But it’s not as strong as the real deal. This is a major roadblock to greater acceptance. After all, women’s engagement rings undergo so much duress. Cubic Zirconia is also distinguishable from natural diamond in that it is unusually flawless and perfect in color. It’s just too good to be true. No, we definitely don’t want to buy Cubic Zirconia. Let’s just leave it for the losers who watch The Home Shopping Network. But what about manufactured diamonds? Can we give a manufactured diamond engagement ring to our women? Also called ‘synthetic’ or ‘artificial,’ manufactured diamonds are produced in a factory. They are atomically equivalent to real diamonds. In other words, they don’t just look the same — they are the same. There is no disagreement on this fact within the diamond industry. Even the head of the well-respected Gemological Institute of America (GIA) has stated that they have all the “same optical, physical and chemical properties of a natural diamond.” And unlike blood diamonds, nobody dies to make them. Most manufactured diamonds come in fancy colors like blue, pink or green, which has limited their opportunity in the mass market, where white engagement rings are the norm. Diamond manufacturers could make white stones just as easily, but fancy colors enjoy a significant price premium, so manufacturers have targeted this more lucrative market first. Consumer acceptance is still surprisingly slow. Manufactured colored diamonds sell for less than a third the price of the natural mined ones. The public may be wary, but commercial enterprises know a good thing when they see it. They know that a manufactured diamond is no different than the ‘real’ thing. That’s why corporations that use diamond in the industrial process mainly buy manufactured stones. In fact, industrial demand is so strong that there are three carats of diamond manufactured for every carat of diamond that is mined. Karl Marx wrote in his book Capital, “If we could succeed, at a small expenditure of labor, in converting carbon into diamonds, their value might fall below that of bricks.” Well, the alchemists have succeeded. Industry is pleased with this development but the man-on-the street is clueless. Marx neglected to consider the power of marketing, as well as the ability of the consumer to be duped. There appears to be a war of words, or better yet, semantics, going on between the various industry players. For instance, in 2006, GIA announced that it would begin issuing manufactured diamond grading reports. This pleased the manufacturers, until they discovered that GIA would use the word ‘synthetic’ to describe manufactured diamonds rather than their preference for ‘man-made.’ GIA also stated its labs would laser-inscribe the word ‘synthetic’ on the girdle of every manufactured diamond it grades. And if this weren’t humiliating enough, GIA’s synthetic diamond reports would be printed on distinctive yellow paper. So, despite its lack of flaws and perfect coloring, the typical woman does not want a Cubic Zirconia ring because it weighs too many toothpicks and can be broken with extraordinary force. Nor does she desire a manufactured diamond, even though it’s atomically identical to a natural stone. What she does desire is a natural diamond ring. Perhaps it’s because ‘diamonds are forever?’ Diamonds may well be forever, but De Beers only introduced that very successful marketing slogan in 1947. Before then, the gems of choice for an engagement ring were opals, rubies and sapphires. And these natural diamonds, which you’re told are a great investment, will lose you money the moment you walk out of the store. Just try selling your ring back to a retailer. Even on eBay, which has made it so easy for the public to monetize their unwanted ashtrays and garden gnomes, diamonds are one product where amateur vendors are at a significant disadvantage. 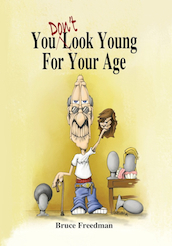 This story is an excerpt from the book, You Don't Look Young For Your Age, by Bruce Freedman. Illustrated by Dusty Hanson and Steven K Von Kampen, You Don't Look Young For Your Age is a collection of humorous essays that combine social observations with personal anecdotes to poke fun at mainstream thinking. Tackling a wide range of subjects, Canadian author Bruce Freedman surmises that conventional wisdom is as wrong as you may think it’s right. Whether its pondering yoga practitioners' popular perception that being stretchy is the path to greater spirituality or uncovering the underhanded plot by parents to fool single folk into having children, the book uses humour and uncanny insight to expose our self-serving notions. What ties all the chapters together is the inescapable realization that wrong can also be right. Read more about it here.